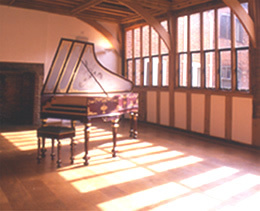 The excellent acoustic and intimate proportions provide an ideal setting for chamber music and solo recitals. The King of Hearts promotes its own Lunchtime Concerts and two yearly Festivals of music and storytelling in May and October, with an emphasis on Early and Baroque music. Harpsichord and Lute recitals, storytelling and literary readings are regular events. Acoustic Jazz and Folk also work well, and the room is available for hire to performers wishing to promote their own event. The Music Room is also suitable for lectures, meetings and functions and is a beautiful setting for civil wedding ceremonies. A Medieval hall of moderate proportions, with beamed ceiling and oak floor. It houses a Steinway piano and double manual harpsichord by local maker Alan Gotto, decorated by Maggie Bevan (soundboard) and Angie Maddigan (case and lid decoration).